In 2013, Mark Bittman of The New York Times reported that American demand for meat was steadily decreasing. The USDA projected a further drop over the coming years. Bottom line, with Mad Cow disease, salmonella poisoning in fast food meals, meat and dairy recalls by the dozens, and a recent horse meat scandal, more Americans every day are considering going the ‘meat free’ route. As a matter of fact, statistics show that the U.S. vegan population doubled in only two years (2009-2011), which has grown even more over the past four years. However worried folks are about the commercial meat and dairy industries, many people haven’t made the leap because they’re fearful of the unknown. The answer to that question is a resounding “NO!” You’ll eat real food that you’re familiar with like pasta, tacos, cookies, burritos, barbecue, sandwiches, pancakes, fried “chicken,” cobblers, burgers and fries, omelettes, and soups. Others may wonder if they can ever really feel satisfied with a non-meat meal… if they’ll feel miserably hungry all the time. The answer to that question is a flat out “no way!” The high fiber in fruits and vegetables will leave you satisfied and feeling full for hours; as a matter of fact, many times you’ll be unable to even finish what’s on your plate. People have come to me, stating that they’re convinced a plant-based diet is the way to go for their own and their family’s health as well as the environment, but they aren’t really sure how to introduce the concept in a way that will gain buy-in from all the household members. Don’t worry yourself! When your friends and family see and taste these fabulous dishes, they won’t believe what they’re eating is vegan, and they’ll end up asking YOU to cook more meatless vegan meals. If you’re overweight, struggling with blood sugar or cholesterol issues, a plant-based diet can be an easy solution to your battle. A vegan diet also helps with digestive problems, obesity, vitamin deficiencies, constipation, high blood lipids, and hypertension. All the information you need on how to get started is right here in this exciting new (and very unusual) vegan cookbook. the focus is on maintaining the flavor and appetizing appearance of the original dishes. My grandmother, aunts and uncles were fabulous home cooks, and several were professional chefs, so cooking is in my blood! 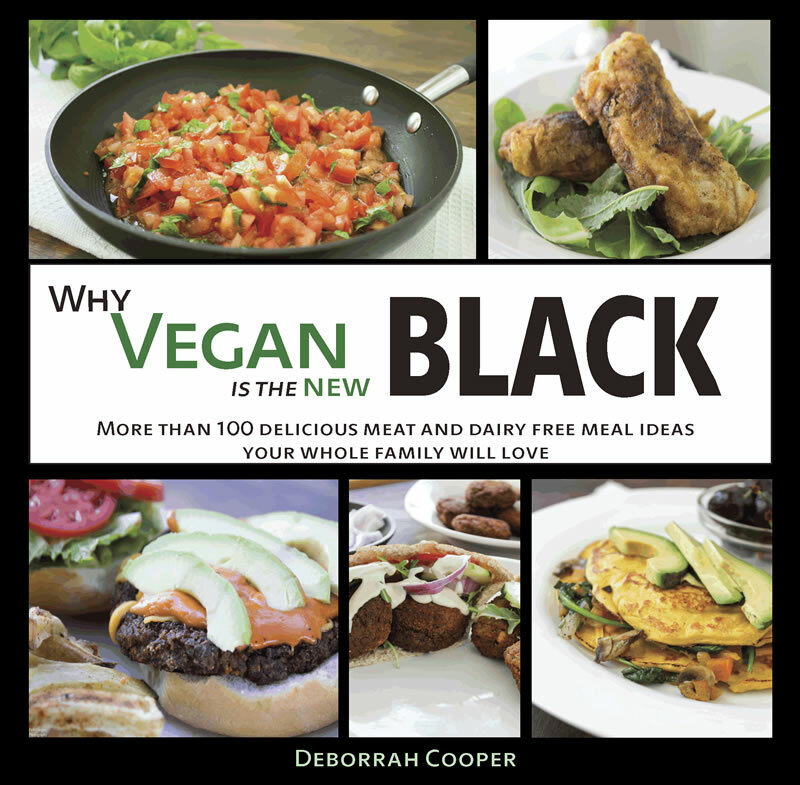 And though this book primarily targets those curious about and new to plant-based/vegan eating, WHY VEGAN IS THE NEW BLACK offers more than 80 different easy-to-prepare vegan recipes big on flavor, nutrition, fiber and visual appeal which are sure to inspire the novice and long-term vegan alike. Hey, look at the pictures on this page… do these delectable dishes like “gross vegan food” to you? Black is elegant, always appropriate, and timelessly classic, just like veganism. Whether you eat one vegan meal per week, or dump animal products altogether, you’re taking positive steps! This book helps you get on the path to animal rights and better health and nutrition with delicious vegan home cooking. Now available for purchase on Amazon.Com. OR you can order from the author website, and get your copy personally autographed. Delivery time is a bit slower however, so if you want it NOW, best to get it off Amazon.